The purpose and goal of this article is to provide information on cleaning porcelain floor tile for the residential homeowner. It will provide step by step porcelain cleaning procedures and explain how porcelain tiles are manufactured. We will also cover several helpful hints to keep your porcelain floor tiles clean and prevent damage. Porcelain floor tiles are manufactured pretty much the same way all fired baked floor tiles are manufactured except porcelain tiles are normally baked at a higher temperature and different raw materials than ceramic or other fire kiln floor tiles. The basic raw materials include natural material such as a specific feldspar material commonly referred to as China Stone as well as other materials and chemicals. Any color to the porcelain tile is added by applying an enamel color to the tile before it is baked. Porcelain floor tiles are either glazed or unglazed. 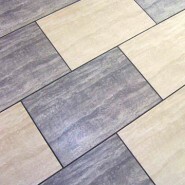 As with all fired baked floor tiles, Porcelain tiles are porous. So glazed porcelain floor tiles are sealed making them non-porous. Whereas unglazed porcelain tiles are porous. Glazed porcelain floor tiles are easier to keep clean because the glazing becomes part of the tile itself. The glazing protects the tile from soil penetrating into the pores; making cleaning glazed porcelain floor tile easier than unglazed tile. There is nothing complicated or difficult about routine cleaning porcelain floor tile. The following are the simple cleaning steps that will deliver great results when cleaning porcelain floor tile. Dust mop or Sweep Floor. Using a plastic putty knife or scraper, scrape any debris adhered to the floor such as gum, labels, etc. Fill a bucket with quality grade rinse free Neutral Floor Cleaner using according to label directions. Using a mop, damp mop the cleaner solution uniformly on floor with the mop or the “That’s Amazing” Cleaning Pad from Unichem Marketing or Mr. Clean Magic Eraser Pad from P&G. Although using a rinse free floor cleaner should prevent the need for rinsing the floor of cleaner residue, it is a good practice to inspect the floor after it has dried. If any residue is present, rinse the floor by damp rinsing with a mop and bucket filled with clear potable water. Never use bleach, acids, ammonia on porcelain tile floors. These type of products can cause damage to the porcelain floor tiles. Always try to purchase glazed porcelain. Glazed porcelain protects the tile and will out wear unglazed tiles.